This tutorial covers how to handle copying or moving your WordPress blog to a new server using ManageWP. The entire process should be over in couple of minutes. First of all you will need a ManageWP account. You can sign up here for a free trial. Then follow these simple steps. 1. Add your website to ManageWP. 2. 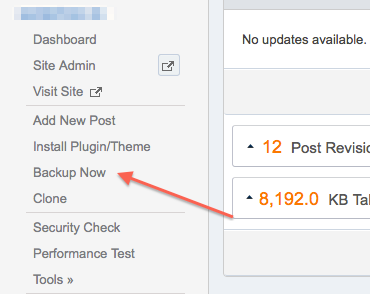 Select the site by clicking on it in the left navigation menu, click “Backup Now” option and create a backup. 4. Go to your new host and create a new WordPress blog using CPanel/Fantastico or by asking the hosting support for help. 5. Go to your domain registrar and switch the DNS to point to the new hosting. Wait for it to propagate. 6. 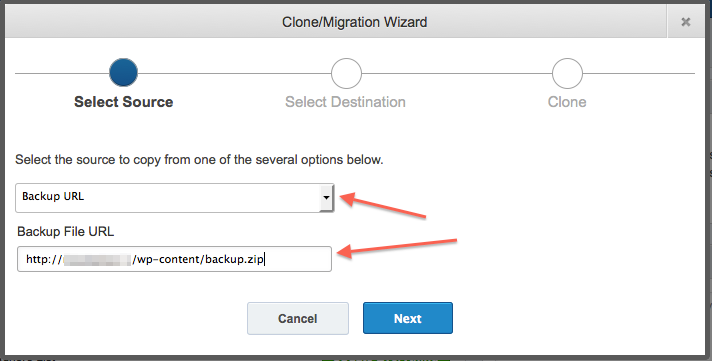 Using FTP program or CPanel file manager upload the previously downloaded backup archive to your new site (for example to wp-content/). 7. Go to ManageWP, remove the old site and add the new site. 9. Select to overwrite the existing site and choose the site from the list below. ManageWP will restore the content of your site on the new server. 10. Remove the backup file from your server. Ugghhh… this is getting frustrated for me. Every time i do it from beginning, I get a new error. I was planning to use migrateweb.com. or if you guys can help me out here. This looks like a permission issue. 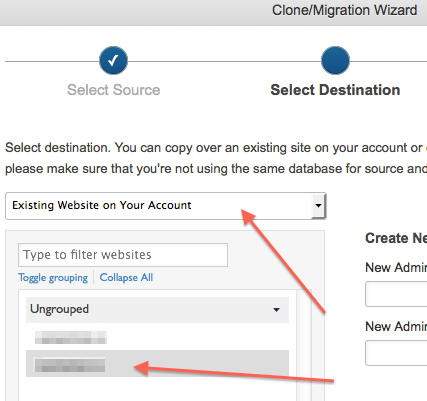 We’ve enhanced our Clone/Migration Wizard even more in the previous couple of months but if you are still experiencing issues, please submit a support ticket so that we can investigate thoroughly. Just have to check the config file as the new wp admin and password didn’t get changed but the old one from the old wp install on the other server works. Probably a really silly question… step #5 (DNS server), is this something I do on the control panel of the previous host… or the new host? If it’s the new how… what info do I enter? Sorry for the confusion. I need to migrate an older v2.8.4 WP site to a new host. The old site has no sPanel. The new one has cPanel. Upgrade to the latest WP is not possible on the old one (one reason to move). I would like to move the entire old installation if a fresh latest WP won’t accept the old stuff. Help would be greatly appreciated since I do not know if ManageWP could do this move. Certainly ManageWP Clone tool can be used for this. I am checking the cloned site and the database folder only has an index.php file in it. could the clone process miss something? I have a cloned site where the admin has all of the files and the slugs have been updated to the new domain. The problem is that on the actual cloned site the links to additional pages give a error not found. Any advice? Thanks in advance. I cloned one site to another site and the new site has lots of URI problems. I used http://validator.w3.org to check. How do I begin to troubleshoot this? Actually, this clone process is the test is I will use your service on going or not. If I can get this to work, I will become a subscriber for my sites. Please assist me in troubleshooting my problem. Thanks in advance. Please submit a support ticket through your dashboard, that’s the fastest way to get support. I’m a little confused over which files I am supposed to FTP to the new site, the entire zipped file? Or the WP-Content like in your example? Also, I keep having trouble getting FileZilla to connect, is there a trick to connecting to a domain on a shared hosting plan? Which files does managewp recurse to change url references in these clones? I’m just looking for a list so I know which other files I’ll need to hand update the urls when cloning. ManageWP changes all links in the database to match the new destination. Does this work going from standalone to multisite? All good suggestions and its on our todo list. Can you please remove my email address that shows up in front of each one of my comments in this post ? Please select a different nickname in your profile settings. Is the backup/restore system coping with this ? Yes this will work with the migration tool. In which plan is the migration tool included ? This would be the Professional plan. I have a WordPress site with multiple custom components such as a page generator that creates new pages from .csv file uploads and a .pdf generator that takes information from these pages and produces a .pdf file. Will all this along with any installed plugins be preserved when migrating to a new host per your instructions? Thank you for an impressive product and attentive support. Yes everything will be cloned over. This kindof worked for me. All settings and content seems to be there. The front page works, but none of the posts do. So th eonly issue with this proces is thatyou have to wait for the DNS to propogate. That means the site will be down for some time. As propogation is radom in timescale how would you monitor it (otehr than anualy checking every hour) to see the propogation? I assume this process deals with the SQLdatabase name being different? Would it be possibel to develop the system further so that f i wanted to move x sites from host a) to host b) it could be one process? So select sites create backup, propogate and restore all sites? Hi, thank you for a great post. it seem very simple, I just wonder what will be the steps if one wish to test the new site before changing the DNS..
what is CPanel (fantastico) ??? also, want to make sure i am doing this write. i have 3 domains & websites on 3 seperate hosts. 2 of those are moving onto the 3rd account (because it is unlimited account and the other 2 are smaller). On that 3rd host i am creating seperate folders in the root directory for each site and setting up the other 2 sites in those seperate folders. the 2 being copied over are both wordpress sites, the 3rd site is not. i did steps 1 through 3 on here for both wordpress sites now am unsure what to do…. Can you please help!!!? Thanks! CPanel is the software found on most hosting accounts. You should ask your hosting about details on accessing it. Hi, I tried to clone a site using ManageWP and it worked, except that the new site’s url redirects to the original site’s url. Please contact us with all details regarding the problem, and we will check it out. Great option Vladimir! Thanks, I was just looking into this. Bookmarked for later reference. is this backup including the whole database? Yes, the database and all files.